In this study, drinking water sources of tube well (TW), pond sand filter (PSF), rainwater, SIDKO (arsenic treatment plant), and Kuya (open well) were monitored in the southwest coastal area of Assasuni Upazila, Satkhira, Bangladesh. Faecal coliform, total coliform, and trace metals, especially arsenic (As), manganese (Mn), cadmium (Cd), iron (Fe), and zinc (Zn), were measured in drinking water. Totally, 73 water samples were analyzed for faecal coliform and total coliform bacteria, whereas 26 water sources from TWs (22), PSF (2), SIDKO (1) and Kuya (1) were inspected for trace metals. The water samples were free from 46.6% faecal coliform and 39.7% total coliform bacteria, respectively. On the other hand, As content has exceeded both WHO and Bangladesh standards. Due to lack of routine maintenance of As treatment plants (PSF and SIDKO), they are impotent in removing As completely. Besides, multivariate statistical principal component analysis indicts the availability of trace metals in drinking water originated both from natural and anthropogenic sources. Mean values of hazard quotient of As for both adult and children exceeded the standard limit, and hazardous index values both for adults and children were very high which might pose a potential human health risk of the study area. Even, TW above acceptable limit of mean carcinogenic risk values of As intimated cancer risk due to the lifespan drinking of As-contaminated water for both adults and children. Authority should take initiative to find priority-basis sustainable policies ensuring potable water sources in this territory. Drinking water sources of 46.6% faecal coliform and 39.7% total coliform bacteria free. Arsenic level exceeds 42.3% tube wells of WHO guideline. Iron level exceeds 73.08% drinking water sources of Bangladesh standard. PCA indicates trace elements in drinking water originate both from natural and anthropogenic sources. Carcinogenic risk value of arsenic for adult and children exceeded standard value 10−4. 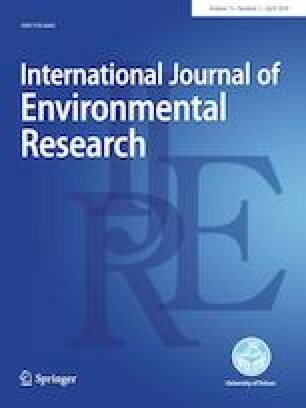 The undersigned authors, with the consent of all authors, hereby assign to International Journal of Environmental Research, the copyright in the above-identified article to be transferred, including supplemental tables, illustrations or other information submitted in all forms and media throughout the world, in all languages and format, effective when and if the article is accepted for publication.